There is nothing wrong with being an employee. It’s often more secure and less risky than starting your own business. But if you really want to earn more than your usual income from your 9-5 job and several gigs, you have to start your own business. Starting a business is never easy. Remember that most of the best things in life are achieved the hard way. You need to do things right. You need to plan properly for your business venture. And one more thing you always have to consider are the business taxes. Starting a company will definitely leave you scratching your head. A capital is needed to start a business – plus the taxes that need to be settled. This can be annoying for new entrepreneurs. One of the most common mistakes startup entrepreneurs do is to do things by themselves. At face value, it seems ridiculous to hire an extra hand when you are just starting and essentially not earning anything. Accounting is actually something you can do on your own. You can simply google the rules on paying taxes and the accounting process – and voila! You can compute your own tax. But the thing is, this involves numbers – and unless you’re an accountant – it may not be your expertise. One of the most common problems young entrepreneurs face when they don’t hire an accountant is overpaying their taxes. So paying for an accountant can actually help you save on taxes. You also have to consider that you are going to be very busy setting up your business. Having an accountant will help you save your time and effort, so you can focus in growing your business. Starting a business means being an all-around employer and employee. You have to make your own calls and answer incoming ones. You have to write down a lot of things and get involved in sales and marketing. You have to organize the office as well and arrange your files. Do you really want to squeeze in another tedious task and add another mental challenge into your already hectic schedule? Taxes are mentally challenging and tedious! Another advantage in hiring an accountant is that this professional knows exactly what you are going through. He or she has seen and reviewed hundreds – even thousands – of cases similar to yours. He or she already knows what you need. In a lot of cases, you don’t even need to provide your hired accountant a complete overview of your business. You just have to relay the basics. Steering the proper direction and even providing insights will happen as he or she has already encountered the same tax problems before. When you transform yourself from an employee to an employer, you might forget to change the setting of your tax-paying activity. As an employee, you are used to being taxed directly by the company. The tax will be deducted from your paycheck. But as a business owner, you have to process the tax payment yourself. Make it a habit of marking your calendar, so you will never forget the dates on filing of income tax returns. Startups should never pay penalties due to delayed tax payments. Any delays in tax payments is like committing a heinous crime. Your company’s image will be marred with penalties. Don’t let that happen. There is an app that will help remind you to pay your quarterly dues. The tool is called the IRS Tax Calendar, which is beneficial for entrepreneurs and self-employed. 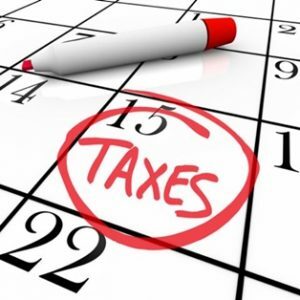 The app features an online calendar that reminds you of your tax obligations via email. The reminder can be set to arrive days or weeks before the deadline. This will give you enough time to prepare the funds for payment. 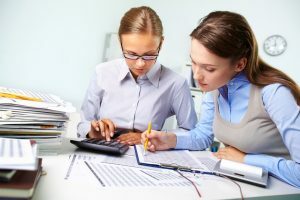 According to Entrepreneur.com, many new self-employed people forget to pay their taxes on the first quarter. This usually happens because they got used to the automatic tax deductions from their paycheck. Make sure to check with your accountant regularly on how much you should be paying for your taxes. Merging business and personal expenses is another serious mistake new entrepreneurs do. This comes from the mindset that you and your business are one entity. Expenses reflected in your company will have a direct effect on your tax obligations. To solve this, your company should have its own savings or checking account(s) as well as a separate credit card. Having separate accounts means that during tax time, you only need to review the bank statements from your business accounts. Moreover, having a separate credit card account for the business means building the company’s credit history, which in turn breeds financial credibility. You also need to have separate containers for receipts or organizers coming from business expenses and personal receipts. This way, when tax season comes, you just have to hand the business-expense container to your tax auditor. The tax auditor wouldn’t mind your personal expenses, but you might as well keep your personal receipts so you can keep track of your personal expenses. Since there is already separate business and personal accounts, you might as well start creating separate budgets. During the last quarter of every year, major companies start collecting budget proposals in every department. You should do this, too. Since you are your own employee and boss, you don’t need to submit a proposal since you will be approving it anyway. But you can prepare a budget that is based on actual income from the previous year. But since this is about startups, you may base your budget on a smart estimate of an expected income. The budget should be less than the expected income, so there will be room for earnings. In fact, your budget should be modest enough and you have to stick to it as much as possible. If you are working from home, it is also important that you create a separate space for your business. This way, you will be able to appropriate funds for utilities and power based on the space. Every business pays for electricity and other utility expenses, so your business should also adhere to that even if you are just working from home. Determine the right type of company you are forming: Sole Proprietorship, Partnership, C-corporation, S-corporation and Limited Liability Company. Don’t go for the easiest type to figure out. Learn the best form that can help you with better tax returns. If you are starting a business, you need to protect your credibility at all costs. This means paying your taxes. There are so many ways to pay your taxes, so you don’t have to worry about where to pay them. Pay your taxes through credit card or via electronic payment options. Always pay your taxes on time to avoid penalties. What’s even worse is losing some of your valuable possessions to Uncle Sam should you continue delaying or avoiding your taxes. The IRS will not let any tax evaders off the hook. As much as everyone hates paying taxes, always remember that taxes affect economic activities. The money from the taxes are used to finance different services and needs of the people. Taxes are why we have roads and why the dilapidated ones are fixed. Taxes help the government provide better service to the public. In the end, while taxes are sometimes considered steep, you always have to remind yourself that your business will also benefit from the taxes you pay the government. The government secures the country through the police and military.Safety should be among the top priorities and this will benefit your business. The United States can also afford to send military troops to other countries through the help of the taxes. In the same manner, the government can afford to donate goods to other poverty-stricken countries and those that are affected by tragedies. Tax is the lifeblood of the country and you should not try to manipulate the system to get exempted from paying such. Paying taxes is for a better cause, but this doesn’t mean throwing away your money to Uncle Sam. Yes, taxes are for a good cause, but you have to make sure that you are paying the right amount. Avoid overpaying taxes by carefully examining the company’s financial records with the help an accountant or tax expert.